HÀ NỘI — No 1 seed Hong Seong Chan easily advanced to the second round of the Vietnam F2 Men’s Futures tennis tournament yesterday in Bình Dương Province. 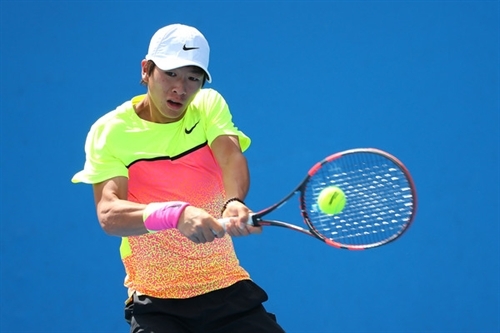 The South Korean, who won the F1 event last week, defeated Japanese Madaki Sasai 6-1, 6-1 in the singles event. He will play the winner of the match between another Japanese, Yuichi Ito, and Australian Jake Delaney. This match and some others were delayed due to heavy rain. Vietnamese hope and No 1 player Lý Hoàng Nam was led 4-5 by No 6 seed Christopher Rungkat of Indonesia before their match was moved to today. Nguyễn Hoàng Thiên also from Việt Nam was defeated 3-6, 1-6 by Japan’s Renta Tokuda, while No 8 seed Arata Onozawa of Japan struggled to beat Jonathan Kanar of France 7-5, 6-4.